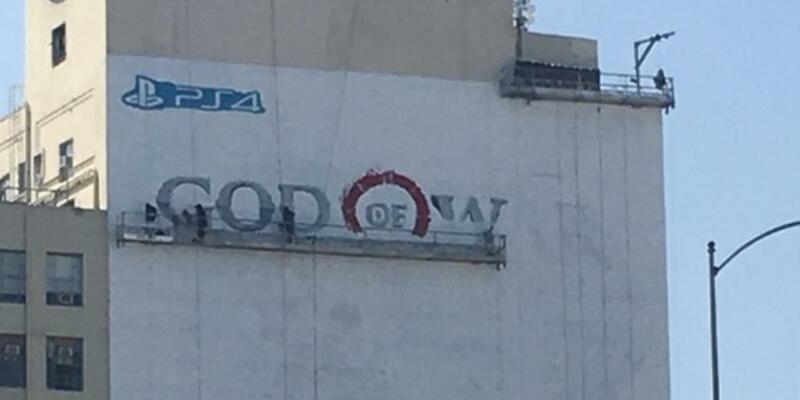 God Of War Mural For E3 2017 All But Confirms It's a Headliner | Nerd Much? So it begins. It’s officially June and the advertising and promotions are being prepared as I write. The lucky folks down in Los Angeles get to watch the making of a huge mural for the upcoming God of War game on the side of a large building in the city. This is the same space they used to showcase Horizon: Zero Dawn, and that was quite the headliner last year (so much so, I nearly expected a Horizon: Zero Dawn themed PS4 to release with it). This could very well mean that God of War is coming a lot sooner than we thought, maybe even by the end of the year if we’re very lucky. If nothing else, that wall is going to feature one massively broad chest and pectorals to rival even Schwarzenegger at his peak. Maybe a kid too, who knows. E3 is literally only days away and it’s time to fire up the hype train and ride into rumorville! Honestly, I’m just wondering how these painters do it. Do they have a stencil? How do they get the lines so precise? Is it not so detailed up close? I’ve seen my fair share of temporary murals and they are tough work no matter how simple they are. And the height! I do hope they are paid enough to be up that high.